A map showing the generalized location of Earth's ten largest deserts and a table of over 20 major deserts. World desert map: This map shows the generalized location of Earth's ten largest deserts on the basis of surface area. The table at the bottom of this page provides the names, generalized locations, and surface areas of over twenty major deserts. Base map by NOAA. Sand dunes in the Sahara Desert of Libya: Most people think of deserts as "sandy" landscapes. That is true part of the time. This is a view of sand dunes in the Sahara Desert of Libya - an area known as the Ubari (or Awbari) Sand Sea. Photo copyright iStockphoto / PatrickPoendl. A desert is a landscape or region that receives very little precipitation - less than 250 mm per year (about ten inches). 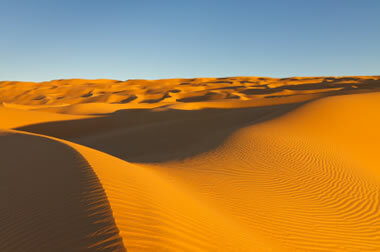 Approximately 1/3 of Earth's land surface is a desert. There are four different types of deserts based upon their geographic situation: 1) polar deserts, 2) subtropical deserts, 3) cold winter deserts, and 4) cool coastal deserts. 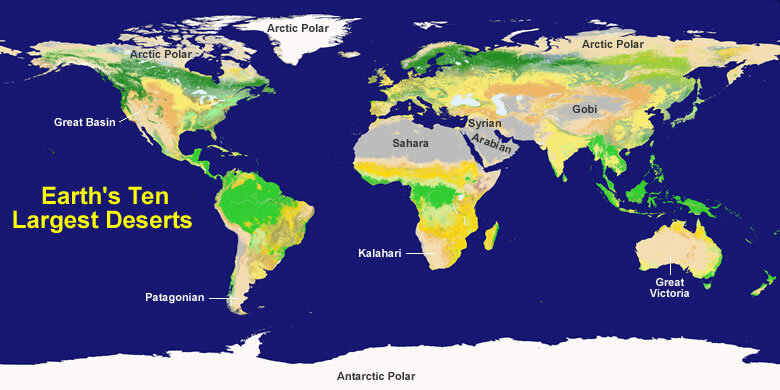 As shown on the map above, deserts occur on all of Earth's continents. The two largest deserts on Earth are in the polar areas. The Antarctic Polar Desert covers the continent of Antarctica and has a size of about 5.5 million square miles. The second-largest desert is the Arctic Polar Desert. It extends over parts of Alaska, Canada, Greenland, Iceland, Norway, Sweden, Finland, and Russia. It has a surface area of about 5.4 million square miles. McMurdo Dry Valleys: The largest deserts on Earth are in the polar regions. 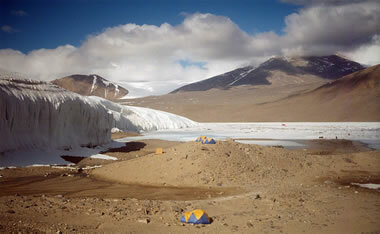 This is one of the McMurdo "dry valleys" near Lake Hoare, Antarctica. The Canada Glacier is in the background. Photograph by Peter West, National Science Foundation. The rest of Earth's deserts are outside of the polar areas. The largest is the Sahara Desert, a subtropical desert in northern Africa. It covers a surface area of about 3.5 million square miles. A list of more than twenty of the largest non-polar deserts can be found below. 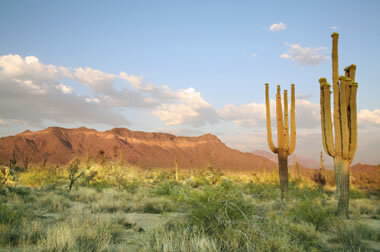 Vegetation of the Sonoran Desert in Arizona: Cacti and grasses in Arizona's Sonoran Desert. Photo copyright iStockphoto / vlynder. When most people think of a desert, they imagine a landscape covered with sand and sand dunes. Although many deserts are sand-covered, most are not. Many desert landscapes are rocky surfaces. They are rocky because any sand-size or smaller particles on the surface are quickly blown away. Rocky deserts are barren wind-swept landscapes. Most deserts receive so little precipitation that surface streams usually only flow immediately after rainfall - unless the stream has a source of water outside of the desert. Streams that enter a desert usually suffer major water losses before they exit. Some of the water is lost to evaporation. Some is lost to transpiration (taken up by plants and then released to the atmosphere from the plants). And, some is lost to infiltration (water soaking into the ground through the bottom of the stream channel). The plants and animals that live in a desert must be adapted to the environment. Plants must be very tolerant to intense sun, prolonged periods without precipitation, and have an ability to prevent moisture loss to conditions of severe temperature ranges, dry winds, and low humidity. Animals must be able to tolerate temperature extremes, temperature ranges, and have an ability to survive with very little water. Many animals adapt to desert conditions by living underground and being active at night.